This is Pork Ribs In Ancho Chiles Adobo. Well actually, it’s a Mulato Chiles recipe; but, I had to substitute it with Ancho Chiles as I was unable to buy any Mulato Chiles in Vancouver. Anyway, I think most of you will know that Mulato and Ancho Chiles are just different types of dried Pablanos peppers. The latter is just a bit sweeter. 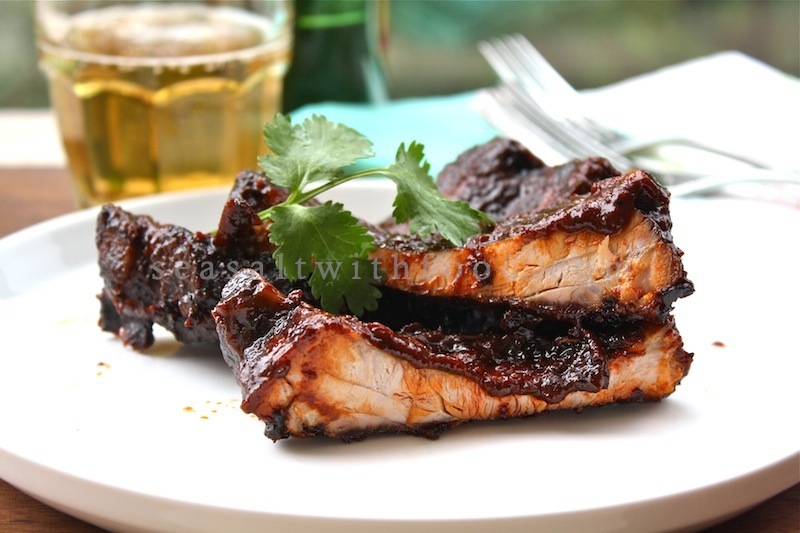 The ribs turned out superb with the sweet, smoky, and earthy flavor adobo. There will be excess adobo after you baste the ribs. So, you can consider the suggestions given by the cookbook i.e. 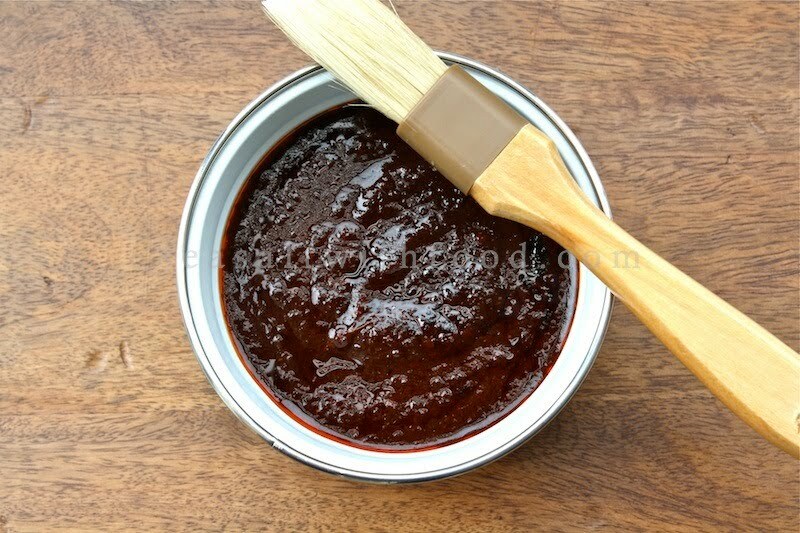 use the adobo for slathering over meats or as a salsa. I also find the adobo tasted great with some tortilla chips too. To make the adobo, in a small bowl, combine the mulato or ancho chilies with hot water to cover and let stand for about 20 minutes to soften. Drain and reserve ½ cup of the soaking water. Transfer the chilies to a blender, add the poblano Chile and the ½ cup reserved water, and process until smooth. Add the onion and tomatoes and process until smooth and paste like. In a sauté pan, heat the corn oil over medium heat. Add the chili paste and cook, stirring constantly, for about 5 minutes, or until it is uniformly dark. Add the piconcillo or brown sugar, olive oil, vinegar, salt, and pepper, stir well, for about 1 minute, or until uniformly hot. Remove from the heat, transfer to a nonreactive bowl, add the avocado or bay leaves, stir gently, and let cool. To prepare the ribs, cut the racks into groups of 2 to 5 ribs, to make easier to fit them into a pot. In a large stockpot, combine the ribs, beer, peppercorns, bay leaves, epazote or flat leaf parsley, salt, thyme, and enough water to cover. Bring to a boil over high heat, lower the heat to a steady simmer, and cook, uncovered, for about 45 minutes, or until the meat is partially cooked and the juices run clear when the meat is pierced with a knife tip. Remove the ribs from the pot and pat dry with paper towels. Discard the cooking liquid. Preheat the oven to 350˚F. 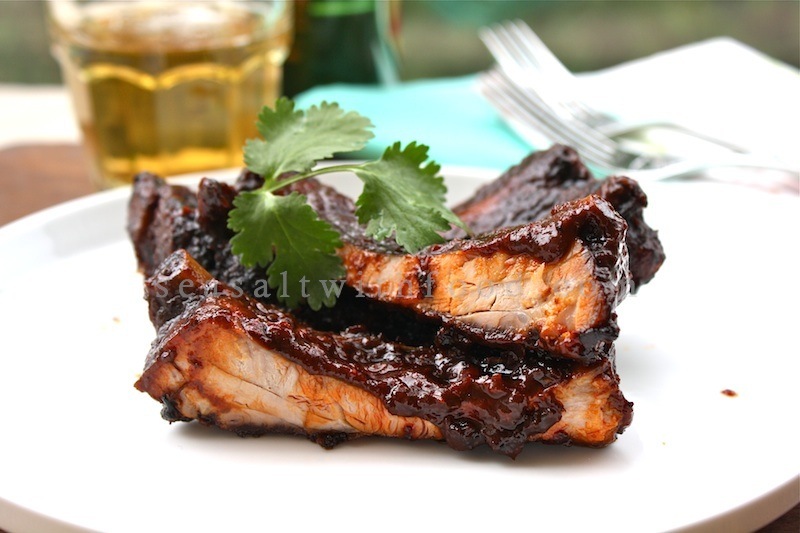 Transfer the ribs to a roasting pan and brush on both sides with some of the adobo. Roast, basting every 10 minutes with the adobo and pan juices, for about 1 hour, or until cooked through and tender. Transfer to a platter, garnish with the cilantro, and serve immediately.